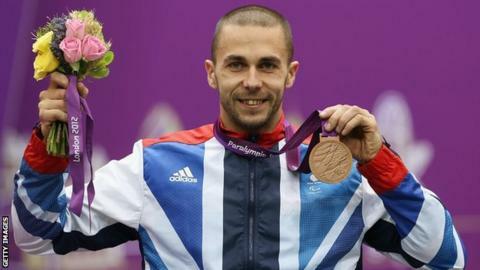 Great Britain's Matt Skelhon won bronze in the R6 50m Rifle Prone SH1 final at Royal Artillery Barracks on Tuesday. Skelhon, 27, scored 693.2 in total to finish third in the mixed event, as he added bronze to the silver he won in the R3 10m Air Rifle Prone on Saturday. "I am speechless. I can't actually believe it at the minute," he said. Sultan Abdullla Alaryan of the United Arab Emirates took gold with 694.8 and Juan Antonio Reinaldo Saavedra won silver with 694.6. Skelhon scraped into the eight-strong final in seventh place in a discipline he only took up 18 months ago. "I came here to win the prone and came away with a silver but I shot a personal best and it was a phenomenal competition," he said. "Now I have got another medal and I'm over the moon with today and dead chuffed to get two medals."